AIMS Tradres have been doubling their accounts within 3 months. Earlier this month, right at the start of this Fantastic New Year 2015 we had the pleasure to share the great news from Silas from Germany who managed to double his account within 3 months of trading. That was after Sam from Australia had shared the great news of doubling his account earlier last year and then later we shared how Michael Zlabinger from Austria successfully managed to double his account in three months. Michael started trading his live account in 2nd week of January 2015. I am so excited to know and share that Michael has successfully made 800 pips this month of January 2015 on his LIVE ACCOUNT. Let me re reiterate how big a job this is. 150 pips a month is more than enough for a very handsome return. But 800 pips, I don't have words to describe the immensity of this achievement. So I'll simply Well done to Michael and wish him the best of trading in the months and years to come. 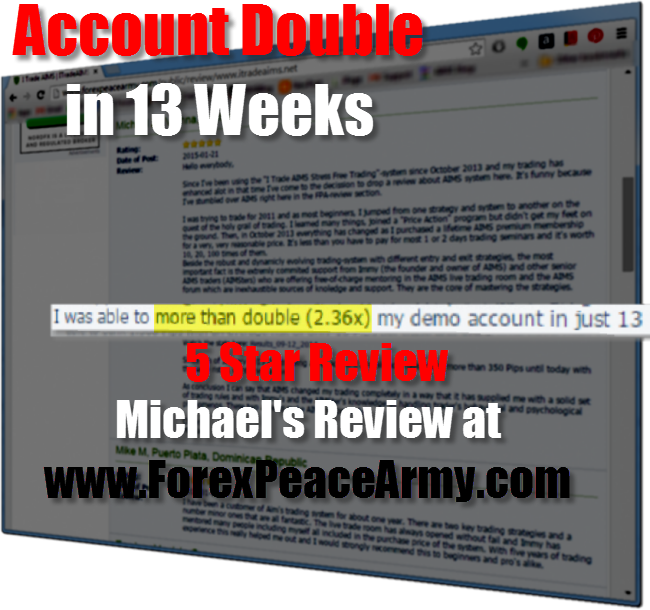 Michael has left a review on the independent review website Forex Peace Army. Please have a look. Joining AIMS Forum means Consistent Success. When you join AIMS we ask you to become an active member of our ever growing members only forum. We ask you to start a Journal. Then you set your self a target. You start trading either demo account or a live account but trading only small lots. This is your training time. We ask you to trade demo for at least 1 month but 3 months is the best. during these three months your goal is not necessarily to double or triple your account. Your goal is to learn to trade the system by remaining disciplined 100% of the time. A trader needs to think in probabilities and this exercise helps to instill professional trading into your mindset. Once its there, you'll become a professional trader for life. And enjoy the benefits of trading correctly. Michael's Success is not a minor event. Its profound. And the biggest secret of his success is his ability to remain disciplined not only with managing his entries and exits correctly but also how he manages his trading time and most importantly how he records his journal on a daily basis. Journal and recording is the key to success and this is what we are proud to provide you inside AIMS community of friendly and lovingly successful traders. Michael shared in his JOURNAL all of his trades at the end of sessional on a daily basis. This is how he learns about himself and at the same time we all get to benefit from his work. A successful formula. His latest post at the end of January 2015 was of particular interest to me personally. He shared the following post. 800 pips in his first month of live trading. If he continues in this fashion soon he will have double his LIVE Account faster than 13 weeks. Its a HUGE Success. Notice that he's added number of hours to the result as well. He trade a total of 34 hours during the whole month still he managed to make 800 pips. Now this is powerful stuff. If he was to risk only $10 per pip he'd be making $230 per hr working only 2 hrs a day Monday to Friday. Michael is an active member of our Live Trading Group that we run on SKYPE. Learn to trade correctly and profitably in the company of new, experienced and consistently successful traders.